This page gives some details on the e164.arpa DNSSEC outage on June 21, 2017. 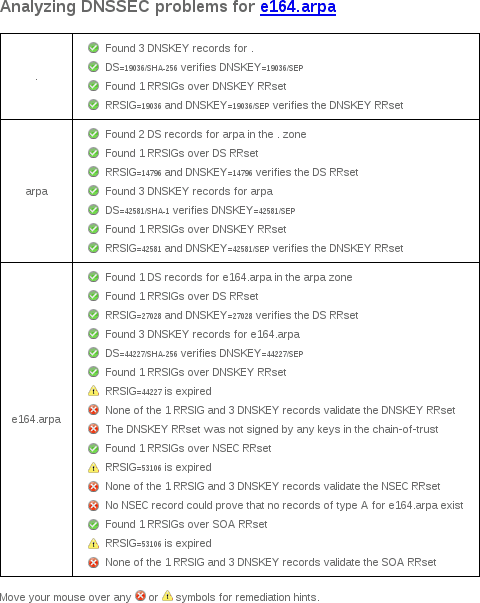 This is not the first DNSSEC outage for e164.arpa. OpenDNS does not support DNSSEC, and instead supports DNSCurve. Google Public DNS currently supports only DNSSEC, and thus, Google's users saw SERVFAIL for queries under e164.arpa during this outage. $ dig ns e164.arpa. @resolver1.opendns.com. ; <<>> DiG 9.4.2-P2 <<>> ns e164.arpa. @resolver1.opendns.com. e164.arpa. 172800 IN NS tinnie.arin.net. e164.arpa. 172800 IN NS sec3.apnic.net. e164.arpa. 172800 IN NS ns3.afrinic.net. e164.arpa. 172800 IN NS ns3.lacnic.net. e164.arpa. 172800 IN NS sns-pb.isc.org. e164.arpa. 172800 IN NS pri.authdns.ripe.net.